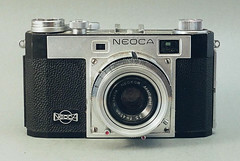 The Neoca 2S is a 35mm rangefinder camera made in Japan in 1955 and 1956. 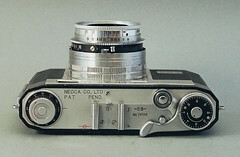 It has a dual-stroke advance lever and a central shutter; neither feature is typical for this kind of camera. 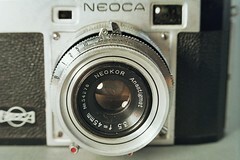 The lens is a Neokor anastigmat f=45mm/3.5. Shutter speeds are B and 1 sec to 1/300s. Depth of field is indicated on the lens barrel. The distance scale is in meters. It has no exposure meter. Users on internet newsgroups report the camera scratches their film. 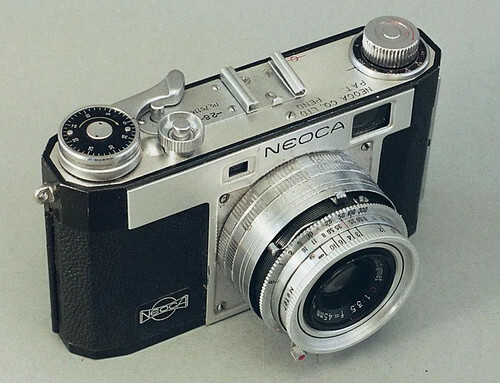 Brumberger sold a version of this camera, rebranded under their company's name.